Captain C. E. "Bud" Anderson in his P-51B "Old Crow". 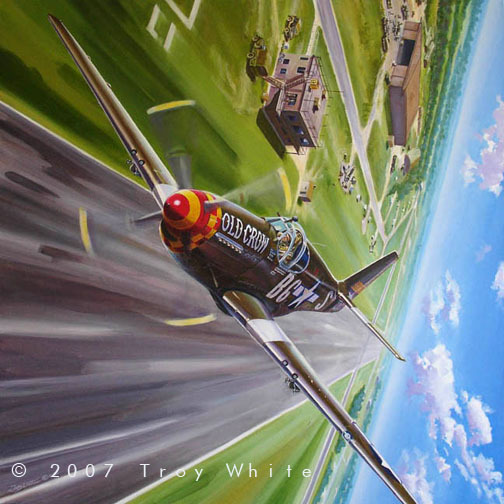 Oil on Canvas 31" x 31"
Captain C. E. Anderson executes a right turn after a low pass down runway 36 to enter the pattern for runway 13 at Leiston air base. 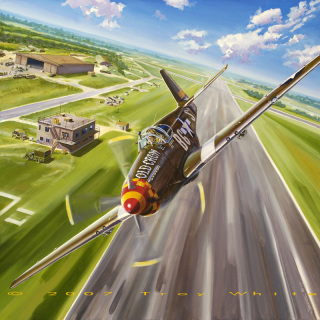 The scene depicts Captain Anderson's P-51B-15NA "Old Crow" as it would have looked just a couple of days before D-Day 1944. Bud Anderson was born in Oakland California in 1922. 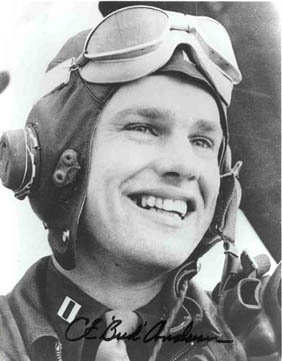 He graduated from flight school at Luke Field, Arizona and was commissioned as a 2nd Lt. in Sept 1942. After flying P-39s with the 328th FG out of Hamilton Field California he joined the 357th Fighter Group at Tonopah, Nevada. 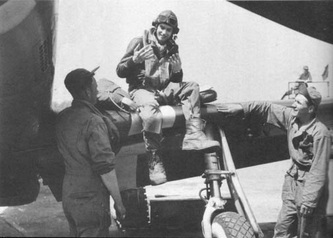 He was assigned to the 363rd FS. The 357th was sent to England in November 1943 and was one of the first units to take the new P-51B into combat. 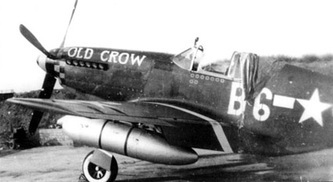 The 357th flew its first mission on February 11, 1944. By that time Anderson had nearly 900 hours logged and had been promoted to Captain. He logged his first claim, an Me 109 damaged nine days later on the 20th. It was over Berlin on the 8th March where Bud got his first confirmed victory. From there Anderson's score rose steadily so that by the time he completed his first tour in July he had notched up 12 victories which included a double on May 27th and a triple on June 29th. After taking a two month break Bud returned to his squadron. On the 27th of November he shot down two FW 190s and probably shot down a third over Magdeburg and on December 5th he repeated the performance over Berlin. The next day he was promoted to Major. Anderson flew his last mission in mid January 1944. By that time his score stood at 16.25 destroyed, in air to air combat, 2 probables and 2 damaged. He also destroyed one enemy aircraft on the ground making him the highest scoring pilot in the 363rd FS. Bud remained in the Air Force after WWII and continued to fly fighters. Although he did not fly combat in Korea he flew two combat tours during the Viet Nam war where he commanded the 18th TFW in 1967 and the 335th TFW in 1970. He retired from the Air Force in 1972 as a Colonel.